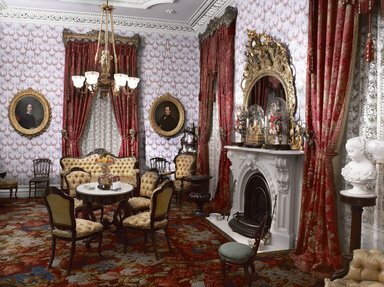 Image 1 – Colonel Robert J. Milligan – House Parlor, 1854-1856. Although this room reads a little bit busy, I like the mouldings and the mixed patterns in the interior. I find the fireplace quite lovely as well. This room feels warm and lively. However, I would add some furniture with modern lines to give the room a simpler look. In fact, many interior designers mix different patterns and ornaments in a more restrained way to create a rich and warm decor that suits most tastes today as we can see in the modern interior in Image 2. Many of today’s interior designers and architects borrow elements from past styles in order to create richly decorated traditional rooms. This is what the American interior designer Tracy Rasor from Dallas Design Group did. She used Victorian elements to create an elegant and formal dining room in a luxurious house in Dallas, as seen in Image 2. The room in this American house has some Victorian style elements. The mouldings have decorative details. Windows are covered with tie-back curtains with tassels and fringe trims. The furniture has heavily carved details. The lambrequin is richly decorated and has gilded details. The room also has different patterns placed together. However, the colours are neutral and more subdued than the colours used in the Victoria era. In fact, the subdued colours give this Victorian-inspired room a more modern-look. I love this dining room. I would happily have a meal in this space. The muted colours bring all the decorative elements together with a more subtle note. The decorative elements harmoniously blend with each other. The room is elegant and inviting with beautiful ornaments, but it feels less busy than the traditional Victorian rooms. I love how contemporary designers use elements from past periods to create cozy and elegant rooms in a way that is appealing to many people today.